As much as possible, I like to make food from scratch. I say “as much as possible,” because sometimes life demands you open a can and not spend two hours in the kitchen. I’m sure we all know the mad dash. 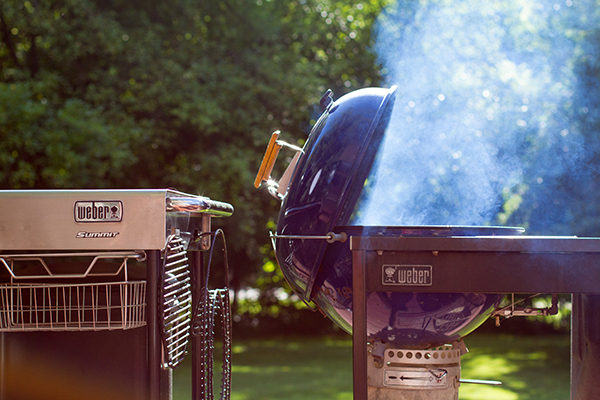 We want dinner relatively fast, and most importantly, it needs to be grilled. 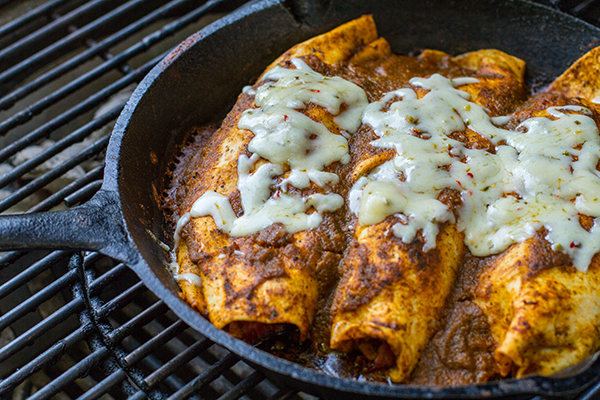 This is why one of my easy weeknight meals are grilled enchiladas. 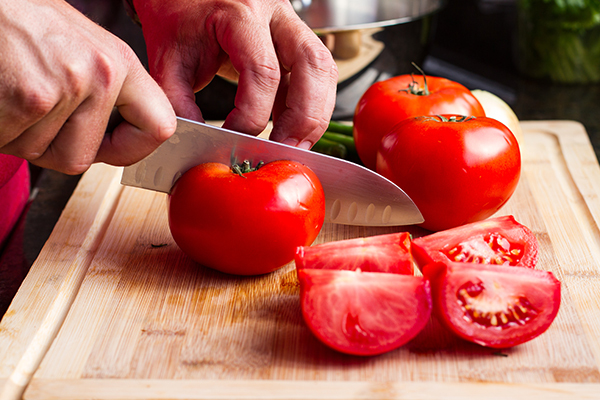 The freezer is sourced for protein, tortillas are always on hand, and opening a can of enchilada sauce only requires a few spins of the wrist. In an incredible set of circumstances, I ran into a reader of my blog a few weeks ago. He owns, Escollo, a brewery, and restaurant in Mexico City, Mexico. Sharing pints as the night went on, I asked him how he prepares a red sauce. Within a few minutes, his chef was texting an ingredient list and rough process. After some translation to English, I was ready to go and adapt it for the grill. While there is nothing wrong with a quality canned ingredient, this recipe, and its happenstance journey, is worth the extra time, especially if it means more time by the grill. Even, on a weeknight. 2. 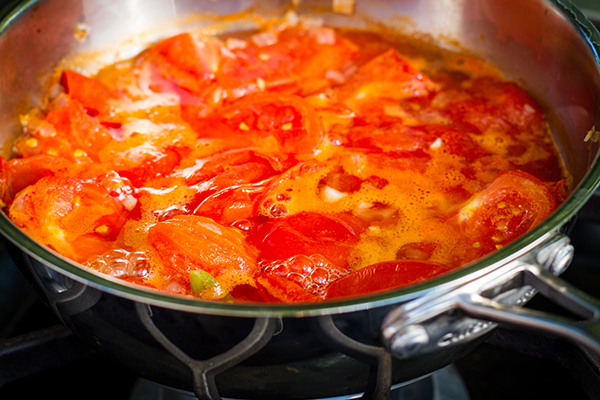 Bring to a boil over medium high-heat and then simmer for 20 minutes until tomatoes are soft. Simmer for 5 minutes more and turn off heat. 3. 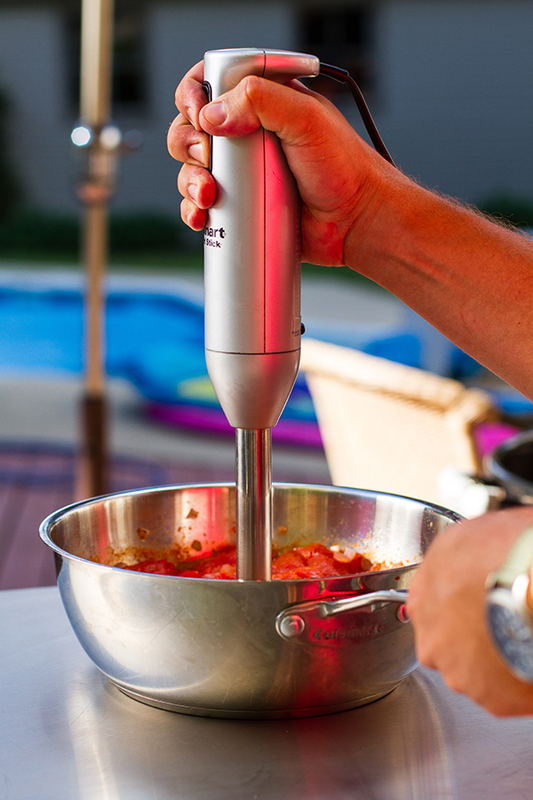 Add cilantro and blend with an immersion blender until smooth. 4. Add 2 tablespoons of vegetable oil to cast iron skillet and heat over medium-high heat until the oil starts to smoke. 5. 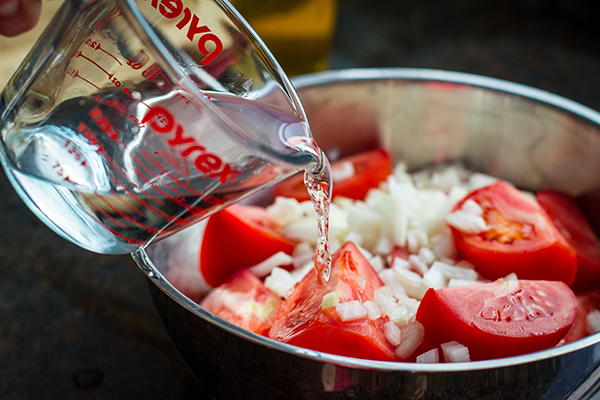 Carefully add the tomato mixture to the cast iron skillet. Stir in the salt and pepper. Bring back to a boil. 7. Prepare a grill for indirect medium heat (350-450 F). 8. 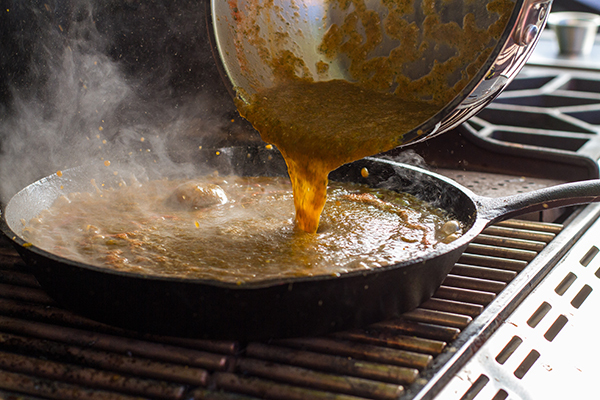 Heat remaining 2 tablespoons of vegetable oil in a large skillet over medium-high heat. 9. 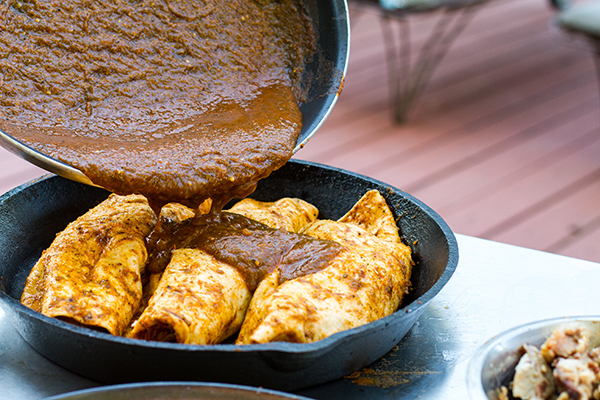 With a pair of tongs, lightly coat both sides of a tortilla in the red sauce. 10. Place a tortilla in the pan with oil. Fry the tortilla for several seconds until it begins to “flutter” in the pan. Carefully flip and fry for several seconds more. 11. 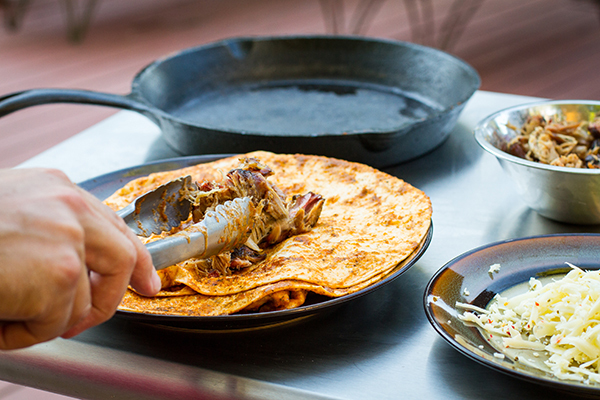 Move the tortilla to a work surface and stuff with about a half cup of pulled pork. 12. Roll the tortilla seam side down and place in a cast iron skillet. Repeat two more times so there are three tortillas in the pan. Note: the tortilla will be hot, so consider using heat protective gloves. 13. 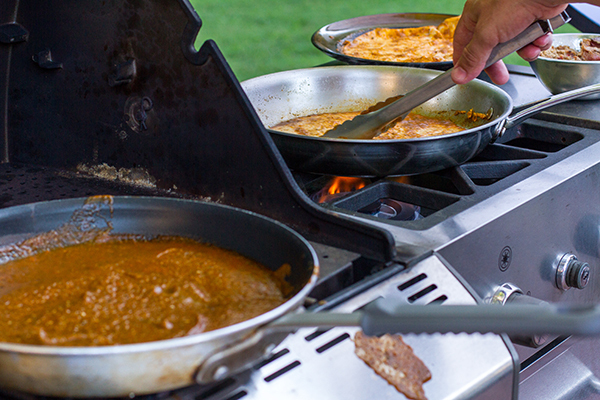 Add another ¾ cup of sauce over the tortillas and place on the grill indirect. Lower the lid. 14. Grill for 20 minutes, adding cheese to the enchiladas during the last five. Remove and serve.